Many cooks are aware of the boiling points of the liquids they most frequently use in the kitchen. For instance, the boiling point for water is 212 F or 100 C. But the boiling point of oil, on the other hand, is much harder to determine. And, honestly, it is not as important as the smoke point. Well before a cooking oil or fat reaches its boiling point, it will begin to smoke. 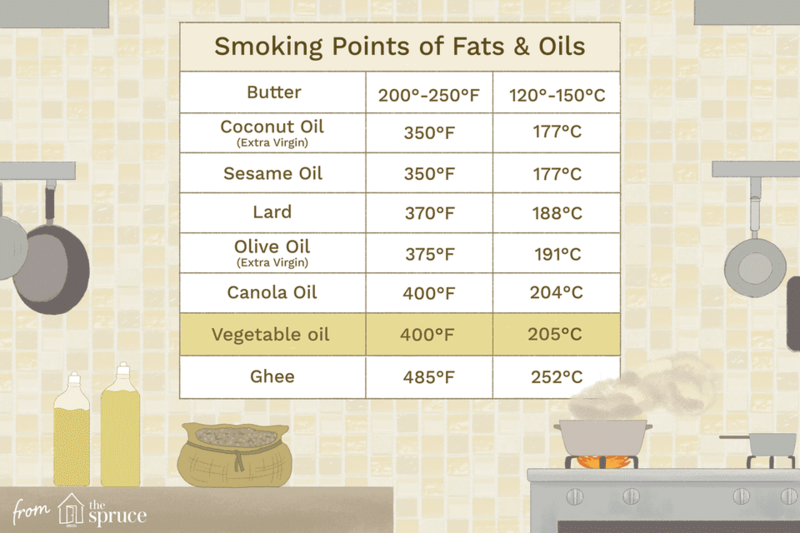 So when choosing a fat or oil to cook with, it is especially important to consider the smoking point. As the name alludes, the smoking point is the temperature at which the fat or oil begins to smoke. Smoking is evidence of the fat's breakdown due to heat and can create a very off-putting smell and flavor. The smoke point for cooking oils varies greatly and depends upon the components, origin, and even level of refinement. The smoke point tends to increase as free fatty acid content decreases and the level of refinement increases. The act of heating oil produces more free fatty acid, a process that drives the science behind the cooking rule of not using the same oil to deep fry more than twice. To help inform your cooking oil choices in the kitchen, common cooking fats and their relative smoking points are listed in the reference table below in alphabetical order, including both their Fahrenheit and Celsius temperatures. When it comes to choosing the best cooking oil for your recipe, there are several factors to consider. Among the most important are taste, nutritional value, and smoke point. For many cooks, the taste and flavor of an oil is the primary factor in their selection. Good tasting food is generally the goal. Today, the nutritional value (or lack thereof) of certain oils is an ongoing discussion and one that has brought previously unfamiliar oils like coconut oil to the forefront of home cook’s pantries. But in addition to flavor and nutritional value, a cook must always consider the preparation of the food, which requires attention to the smoke point of the oil. For instance, the delicate flavor of almond oil can be ruined by heat making that oil best for cold dishes. Whereas the high smoke point of coconut oil makes it a favorite for stir-frying. As a general rule, when frying foods, it is important to choose an oil with a very high smoking point. Most foods are fried between the temperatures of 350 F and 450 F so it is best to choose an oil with a smoking point above 400 F.
Fats and oils with lower smoking points, like butter and olive oil, are best suited for lower temperature cooking methods such as pan sautéing.